Ouch…Maybe Jupiter could start wearing an eyepatch? Dang, that was half his health right there. And I would agree on an eyepatch, but since he’s not intent on joining the crew anytime soon(i.e. being a Pirate Hunter and all), he can’t become a honorary pirate. Also excited to see how Jupiter reacts to his rebellious brother…possibly by electronically warning the other Hunters of the new threat? And also, will Jupiter’s &or Pluto’s turn be next? Whatever Pluto’s wearing is dissolving, so Jups will have to suffer until he can afford eye surgery within now and by the time he’s killed(possibly soon? unless plot-twist). And I always thought Pluto was wearing a helmet-shaped hood or a helmet under his hood…we’ll know when his clothes dissolve. Gosh, a naked robot. How indecent! Someone will have to cover S.P.’s eyes I’m afraid. What did he do his first turn? Also that is so awesome you drew me a picture! Regarding your other comment: V.M. 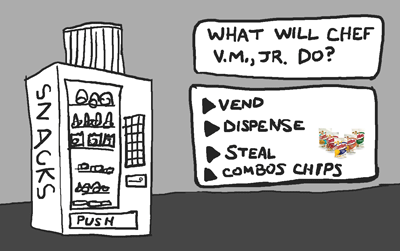 used Dispense! …But it failed! Good thing he didn’t use Combo Chips. That’s a One-Hit K.O. Of low-calorie destruction and deliciousness. 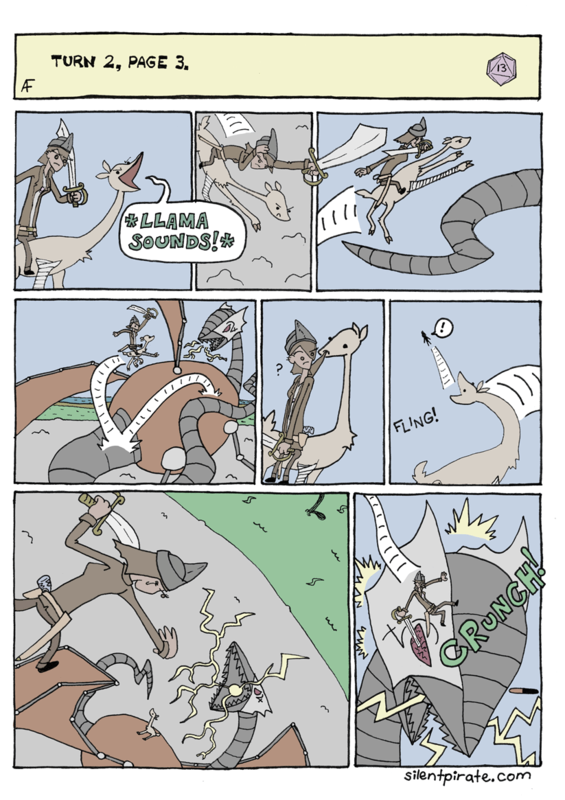 I’ve got to say, Silent Pirate has inspired a return to better-using emenata in my own strip. I took a long break from drawing and comics while at college. When I returned to comics, I’d lost track of it – however your strip definitely has restored how powerful and wonderful it can be. I put it to good use in one of my latest pages, 135. Thank you. The missed deadline was a simple mistake in time management, but I don’t like missing deadlines at all. Obviously Jupiter doesn’t watch the New Yankee Work Shop. Doesn’t he know your always supposed to wear safety glasses when you battle?